The UK's largest motor sport event, the Brighton Speed Trials is under threat from the local authorities. Brighton and Hove council is currently reviewing the future of this unique event, which takes place on the town's promenade every year - but the event's organiser is fighting back by drumming up public support. 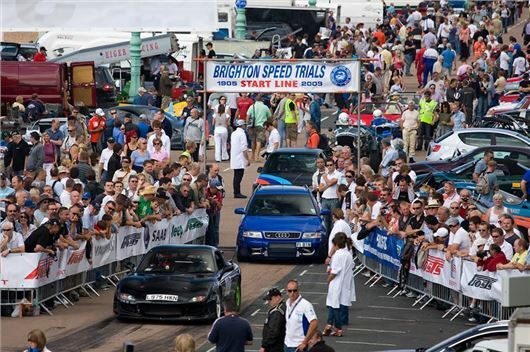 The Speed Trials has been running in Brighton since 1905 and is one of the UK's longest running car event - taking the form of a sprint for some of the UK’s best race cars and motorcycles along Madeira Drive. More than 200 vehicles line up to take a timed run including road cars, race cars and drag bikes who compete to win the fastest in their class. A top six run-off to find the fastest car and bike brings the day to a dramatic close. There are many ways of showing your support. Either visit www.savebrightonspeedtrials.com or go directly to the petition which is on the Brighton and Hove Council web site and sign it now: http://tinyurl.com/qjtbmub. Updates will be posted to Twitter, at @SaveBST and you can like the Facebook page, www.facebook.com/savebrightonspeedtrials The council will be making a decision on 23 January 2014.